Penny Dora and The Wishing Box #1 (Published by Image Comics; Review by Draven Katayama; ‘Rama Rating: 9 out of 10): Holidays can be a magical yet isolating time for children whose loved ones are absent or don’t share the same level of excitement. 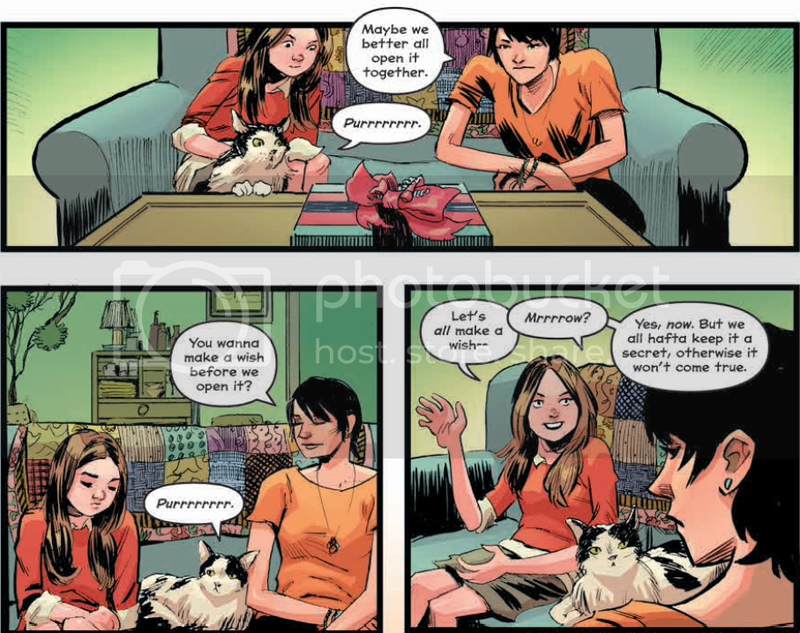 The star of this all-ages comic is Penny, an easygoing girl who shares a simple life with her mom and their cat, Iggy. I like how Michael Stock captures the anticipation a child feels while decorating a Christmas tree or thinking about opening presents, and contrasts it with Penny’s mom’s pragmatic vacuuming the moment the present-opening is done. Tamra Bonvillain’s colors are magnificent, especially the bright, glossy wrapping paper Iggy gets tangled in. Sina Grace’s every detail, from quilt patchwork to a teddy bear’s fuzzy fur, make this a gorgeously illustrated, thoroughly enjoyable mystery that kids and adults alike can appreciate.